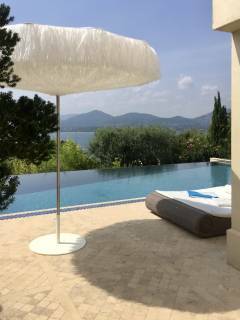 The villa “Liaison d`été” is ideally located in the district of Gassin on the border to Saint Tropez. This location offers quick access to the center of Saint Tropez, the beaches and a nearby shopping center. A private access road allows guests to conveniently avoid the traffic congestion on the coastal road in the summer. The villa has allowed us to fulfill a longstanding dream. We have furnished and equipped it with tender loving care. This year, we want to rent the villa for the first time and we think it would be ideal for people who are looking for something special and who know how to appreciate beautiful surroundings. Altogether, the villa encompasses 260 square meters of living space. The villa’s roomy tower stairway leads to the upper floor with its spacious living/dining room (fireplace included), American-style kitchen, guest bathroom and pantry. Situated on the upper floor of the villa, the living/dining room opens out onto a full-length terrace on the side of the house facing Saint Tropez. Affording a spectacular view of the harbor, the terrace leads to a large Mediterranean-style lounge. The wall of the lounge that faces Saint Tropez is made of an entirely retractable glass-panel. With the panel open or closed, those in the lounge are also afforded a wonderful view of Saint Tropez. The terrace includes a stonework outdoor grill. A second terrace at the rear offers a splendid view of the harbor and the seaside town of Sainte Maxime. Three bedrooms are located on the garden level. Each of the bedrooms has its own bath and two afford a view of the sea. The large infinity pool, with a depth of up to 3.5 meters, is also located on the garden level. The depth of the pool and the color of its tiles make its water the same color as that of the sea. This gives bathers the feeling of being seamlessly connected to the sea. The pool can be heated and outdoor lighting fixtures ensure pleasant pool use in the evening. The pool is also equipped with an electric cover and an alarm system designed to protect children. The large pool-side area is partially covered by a roof to give sunbathers the option of escaping the hot sun. The beautiful 1,250 square meter garden provides many pleasant little places for relaxation and reflection. Depending on the season, fresh figs, oranges, lemons, tangerines, kumquats, grapes and pomegranates can be eaten directly from the tree. Relax in the whirlpool or in the hammock among papyrus and bamboo plants. A separate apartment with a bath and kitchenette is available for guests. We look forward to filling you in on all the details – as well as a secret or two – to make sure that your stay is as pleasant and enjoyable as possible.